Gaston Leroux’s classic tale gets an updated modern day tale of a man who seeks revenge while protecting the woman he loves. A new mall is opening and youngsters Melody, Susie, and Buzz, who are friends, all have jobs within the mall. Melody and Susie find jobs at a fashion store while Buzz works in a yogurt kiosk in the food court. Melody is still haunted by the death of her boyfriend Eric, who had died a year ago in a house fire and the mall happens to be where the house once was. However, a mysterious figure wanders in the mall and it comes to no surprise who the figure is. When the still-alive but horribly disfigured Eric kills a security guard, it is a message to mall owner Harv Posner. Posner, who is clearly the one responsible for the fire that apparently killed Eric, hires the arsonist, Volker, as a guard. When investigative reporter Peter Baldwin joins up with Melody in learning the connection between Eric’s apparent death and the mall, they soon learn that Eric is not only still alive, but will do anything to keep Melody to himself, no matter who gets in his way. The classic tale Phantom of the Opera has been given many screen treatments, yet there have been variations including the 1974 cult hit Phantom of the Paradise. 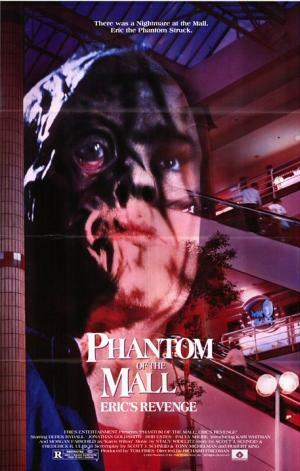 However, to capitalize on the 1980’s slasher genre, the tale now gets an updated look with our “Phantom” causing trouble at the newly developed mall that was once his home. While the film begins with the love story of Eric and Melody and then jumps to one year later, we see through a flashback the incidents that caused the birth of this Phantom. What is interesting is that this film is practically a combination of three different genres. They are the teen film, the slasher film, and in a major surprise, the martial arts action film. The latter is truly shown when during sections of the film, a new empowered and disfigured Eric is kickboxing and then doing a martial arts form with the use of the bo staff. It may come as a bit of a surprise that lead actor Derek Rydall, who plays Eric, actually performed most of his own stunts and fights for the film. While the film would be Rydall’s only lead role in a film, it is quite a good role. He not only fights, but uses the traditional brand of slasher methods when necessary, including using a lasso to a victim and attaching it to the mall’s escalator. Kari Whitman is great as Melody, who constantly has visions that her one time beloved is still alive while future Silk Stalkings lead star Rob Estes does quite well as investigative reporter Peter. Interestingly, Estes was training to be a stunt double and performs his own stunts when he has a chase scene against the insane Volker, played by veteran villain actor Gregory Scott Cummins. Those expecting Pauly Shore to act uncontrollably goofy will see that this was before his trademark “Weasel” gimmick and plays just a lovestruck yogurt clerk who eyes longtime friend Susie, played by Kimber Sissons. Phantom of the Mall: Eric’s Revenge is an underrated 80’s thriller than combines action and horror with a very good lead role for Derek Rydall as “The Phantom”. A Fries Entertainment production. Director: Richard Friedman. Producers: Thomas Fries, Robert J. Koster, and Paul Little. Writers: Tony Michelman, Robert King, and Scott J. Schneid; story by Schneid and Frederick K. Ulrich. Cinematography: Harry Mathias. Editing: Gregory F. Plotts. Cast: Derek Rydall, Kari Whitman, Jonathan Goldsmith, Rob Estes, Pauly Shore, Kimber Sissons, Gregory Scott Cummins, Tom Fridley, Ken Foree, Morgan Fairchild.